As predicted, work has been increasingly crazy this month and this week in particular was a killer. It was also my dear Fiasco’s birthday, and while he sadly did not receive his birthday socks finished on time, he did receive a pretty good-looking surprise birthday pie, instead. BMFA STR HW, colorway Grimm. Click for project page. These socks are a tad further along than shown here, I plan to buckle down on them this weekend and get them on the Fiasco’s feet ASAP. It should be a little easier to finish them now that I’m not trying to be sneaky about it. BMFA STR LW, colorway Gran’s Kitchen. Click for project page. Despite a lack of photographic evidence, I am still slowly working on my Tour de Fleece spindle spin. This is the second half of the first ounce, but it’s going! I haven’t had much time to spin since my triumphant finished skeins earlier in the week, but I did take a second to get my next (and likely last) TdF spin started. This is some undyed Wensleydale, which is a gorgeously silky longwool. 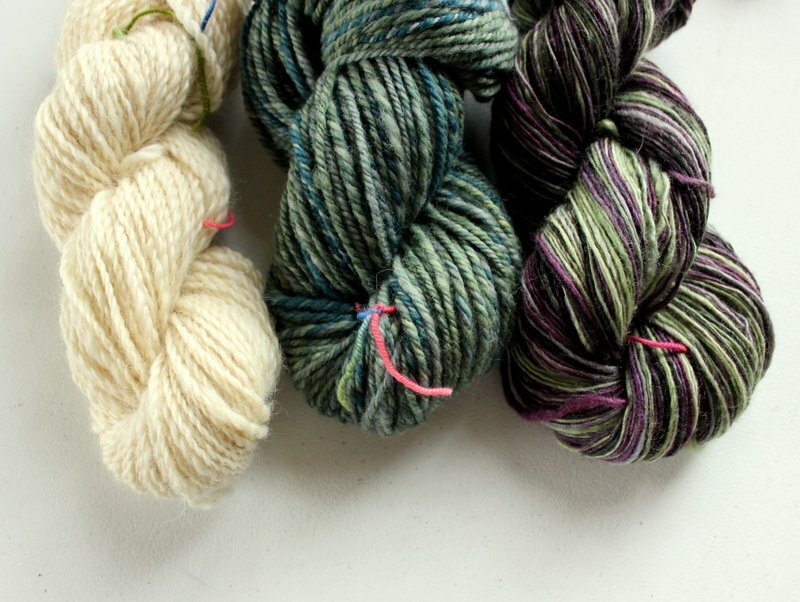 I’ve spun Wensleydale before in a pretty gradient, and am aiming to make a coordinating 2-ply yarn to use in a stripey project of some kind. Check out the length of those fibers! Luscious. I was super duper excited when my pre-ordered copy of The Natural Beauty Solution by Mary Helen Leonard arrived in the mail. Mary writes the blog for From Nature With Love, a Connecticut-based soap-making and skin care ingredient supply store that I purchase some of my Sweet Sheep raw materials from. Her recipes are interesting and informative, and the book focuses on making your own skin care products from fresh ingredients. The book is beautifully photographed, too. I likely won’t be able to adapt many of the recipes for sale since they are designed to be kept refrigerated and used within a week, but I am looking forward to experimenting with my own routine! 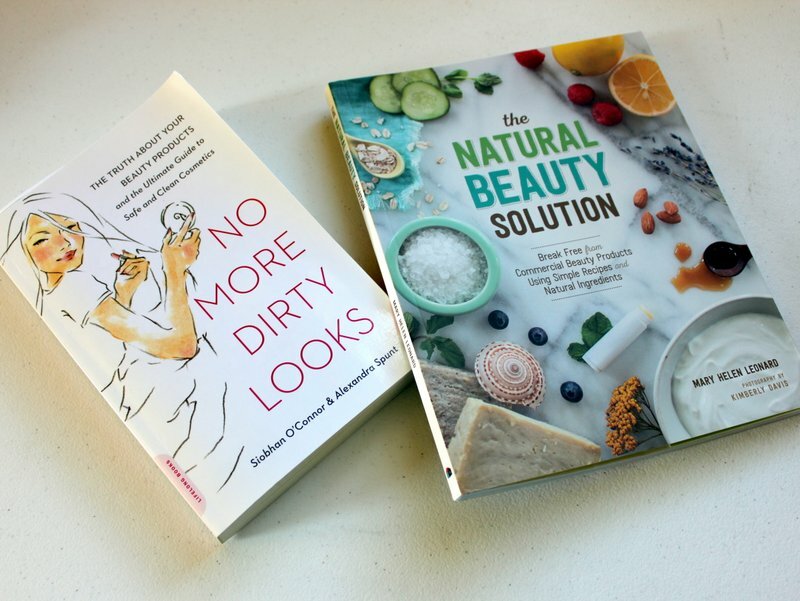 Next, I was inspired to pick up the copy of No More Dirty Looks that’s been in the queue for a while, to learn more about exactly which components of commercial beauty products are so bad for your skin. Turns out, the answer is most of them. Guys, this book is like a ‘scared straight’ program. It’s making me want to chuck out everything I own that isn’t already all-natural, which at this point isn’t much since I buy a good proportion of whatever beauty products I don’t make myself from Lush. The number of carcinogenic and downright damaging ingredients that are in most products, along with the completely bogus industry regulation (9 ingredients are banned from use in US cosmetics… while there are over 1,000 banned in the UK) are pretty intense. It’s a really great read so far and I look forward to going into more detail as I experiment with some replacement products. Speaking of natural body care, Sweet Sheep Body Shoppe will be vending at the Meiklem Kiln Works Arts & Wellness Fair TOMORROW, Saturday 7/25 from 10 am – 4 pm in Bozrah, CT. Come say hi, and check out our new summer fragrances, like Blackberry Sage! Phew! When I don’t write for a while, looks like it all comes out at once. Hope you’re all having good weeks. Linking up with Yarnalong and Stitch Along Wednesday, despite being a few days delayed.